Safety and Traceability is essential in nowadays complex and global supply chains. Consumers have high expectations towards Brand owners to ensure food safety and quality. Allergens have made the bulk supply chain more complex. Transportation of liquids in Bulk tankers differs from any other form of transport by means that the cargo comes without packaging in direct contact with the transport-equipment. The cleaning of the tank is therefore a critical control point. In Europe are some 800 tankcleanings active. As such cleaning the tank is mostly a remote process to the transporter, shipper and cargo owner. How can be secured that the cleaning was performed in line with the quality requirements of the transporter, shipper or cargo owner? Nowadays procedural quality securance is based on cleaning certificates and defined responsibilities. However serious incidents have proven this not to be sufficient. Living in the data age, collecting real time process data and converting this into management information is viable. May cargo owners have the idea that the responsibility for consequences of a poor cleaning is with either the cleaning station or the transporter. It is wise to know the legal context. The Tank Cleaning stations are often small size enterprises. Passionate and committed workers. However with basic skills with respect to food-technology and chemical treatment. Their margins are low, process time is essential. Will they stop the process if e.g. the water temperature is slightly below the requested standard? Or will they continue given their ‘expertise’? They act in a highly commoditized market which is under strong price pressure. The cost of cleaning can be well 25% of the total transport-rate. Return on turnover is below 2%. The Tank Transporter industry is not self-regulatory. The legal framework is CMR, which excludes the responsiblity for the transporter to cargo damage of bulk transportation in book IV article 17.4b. Click here on the link for the full text of the CMR convention. They are often not fully aware of the risks and consequences. However they are better industry self-controlled, have more power in the supply chain. It is the cargo owner who has a responsibility for his cargo both legal and moral. They have specific product knowledge. In case of serious claims, most often the cargo owner bears the damage to both the product and/or his brand value. In modern supply chains there is serious cost pressure on the transporter. As a result he will purchase his cleaning against sharp prices. As a consequence we observer shorter cleaning processes, where the cargo owner is at distance. Driver is instructed to request your cleaning procedure at a participating Cleaning Station and CleanSecure monitoring. The actual process data is then recorded during the cleaning process (Temp, Time, Soap, Steam etc.) with in-inline built in sensors. 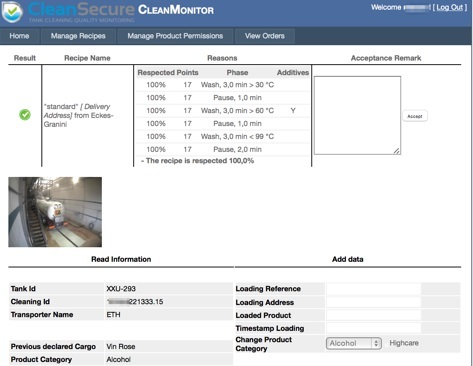 The Cleaning operator can see the your requirements and monitor progress during cleaning. The driver receives at the end of the cleaning a Process Document with QR barcode. This Barcode is the key to the remote process data. No longer endless discussions with the drivers upon tanker reception about cleaning documents. The reception scans the barcode and has instant online access to the cleaning recordings. On-line validation of real cleaning process-data against customer cleaning requirements prior to loading/unloading. Full traceability of the cleaning process afterwards.